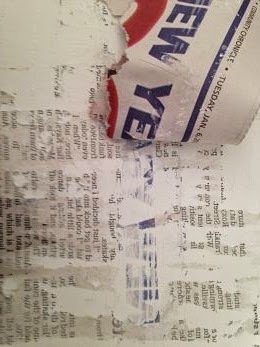 The prompt for DLP this week was use gesso and the one for Journal 52 was Just Be... This is what I ended up with after playing for a large party of Saturday. I started with a thick layer of gesso. I carved lines in it with an old paint brush that was very stiff with paint. 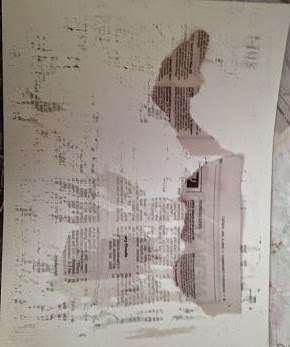 I thought I'd try a gesso/newspaper transfer. I was told to let the gesso almost dry and my impatience got the best of me and I didn't follow those instructions. My gesso was too wet and I kind of made a mess as you can see above. I decided I'd go with it and see what happened. 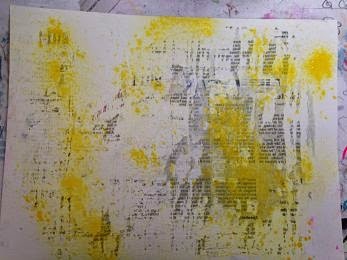 Next I tried some yellow spray ink. I have no clue what kind it is. It was in a bottle I've had on my shelf for months. Next I added some pink Radiant Rain. I ended up spilling the pink spray and as I type I still have pink fingers even have a shower, many hand washing and even cleaning brushes. I'll go to work with pink tinged fingers... Oh well they are use to it by now I hope. I love this next photo because it shows the texture I got from using the thick gesso. After it was dry and I'd cleaned up my pink table I added more pink and yellow creating a bit of orange in the background. 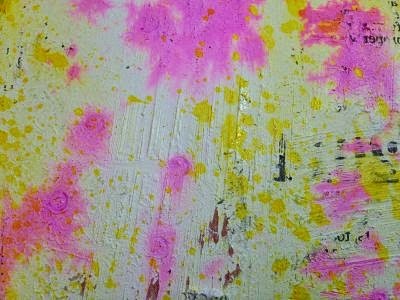 I also used some Golden High Flow Acrylic Purple paint with a homemade mark maker (aka a credit card cut with pinking shears) and a Catalyst tool to add additional texture to the background. I also used whatever else was sitting on my table to make additional marks. The truth is I just played until I liked how it looked. I added bits of green and orange craft paint and a few stamped images. The flower is made of gelli prints and a Sizzix die. I found the quote on facebook and have been saving it for the right page. 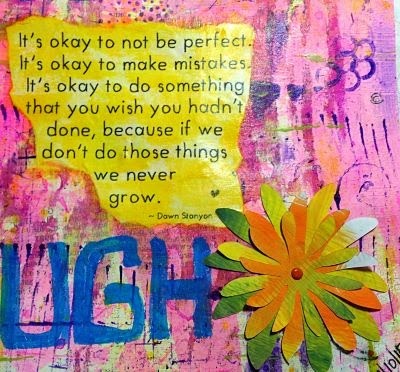 I love the idea that it's ok not to be perfect. The quote was perfect after the mess I made with the transfer. The large words were done with a paint pen from WalMart. It's something I tell myself often. 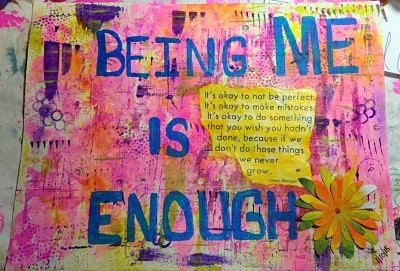 Being Me is Enough. If you are art journaling I hope you are playing and having fun. Whatever you create is enough because it's yours. There are so many things in life that are difficult... art journaling is not one of them. It's a place to play, have fun and let go of the anxiety of life. Some say we're supposed to embrace our imperfections .. I'm not so sure about that since it means we'd have to have imperfections in the first place. Imperfect - compared that what, or whom? I am perfectly me, perfectly where and how I'm supposed to be at this point in my life. If I were any different right now, I'd be someone else with someone else's history and experiences. This goes for my artwork as well. If I could paint like Michelangelo, I would not be me and I would have had a whole different life behind me - someone else's but my own. Fabulous work! Love all the lovely gesso texture. As I have gotten older I have got less hard on myself. I used to rework artworks to death and that was a mistake too. Let it go....that's my attitude these days. Happy PPF!! I love the colors and I think your background is fab-love those happy mistakes! Must try this myself. Thank you, Linda... Carolyn Dube calls an Oops.. An outstanding opportunity presenting suddenly... I'm going with her philosophy. I love the words you chose here! It's a valuable sentiment for so many people and resonates deeply with me. The colors your chose are striking! Thank you for joining our challenge this week and for reminding me of an important message I try to hold next to my heart!